Material: Soft quality italian cowhide leather with nice and smooth texture. looks even better after using for a long time. 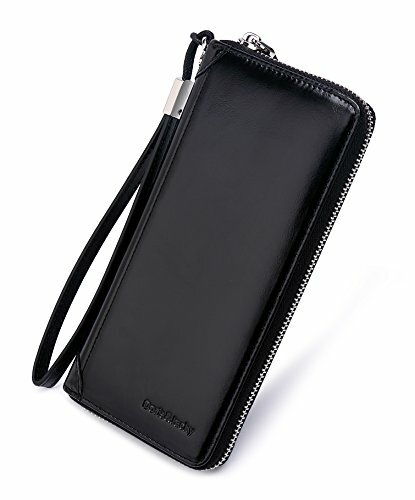 Size: 7.63"L*3.75"W *0.88"H inches, Slim & Stylish. we choose 100% full inspection for our leather wallet ,if you are not satisfied with our wallet, we will refund you entire purchase or free replacement, whichever you prefer. 1,About the color : The real color of the bag may be slightly different between the photo and the actual item shown on website caused by many factors such as brightness of your monitor and light brightness. 2,About the size: Please allow 0.3"-0.9" in size error due to manual measurement. And please confirm the size info according to our description instead of the photos . 3,About the care : To maintain the leather, we should keep it away from sharp items, oil, chemicals, humidity and heat source. Clean it with dry soft cloth when got stains. MATERIAL: Imported italian soft natural leather,Looks even better after using for a long time. Guarantee & Packaging: We choose 100% full inspection for our wallet,If you're not satisfied with our genuine leather wallet,then we will refund your purchase or free replacement, whichever you prefer. Came in a black∨ange gift box with a soft duster. If you have any questions about this product by Doris&Jacky, contact us by completing and submitting the form below. If you are looking for a specif part number, please include it with your message.